Sum-up of the wedding vibe: A celebration of love, with a few glamorous touches thrown in for fancy flair. Rebecca’s attire and accessories: $178. 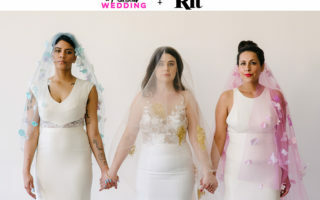 It was $135 for the rented dress, hairpiece, and earrings (with a buy-one-get-two-free coupon, shipping, and insurance included), $35 for shoes (on sale! ), and $8 for birdcage veiling (including shipping), which was hand sewn and attached to the hairpiece. The gold beaded clutch was already owned, and the vintage mink stole was an heirloom piece borrowed from a friend. Donnie’s attire and accessories: $105. We purchased a shirt, tie, pocket square, and belt, and he wore his own suit jacket, pants, and shoes. This cost also includes dry cleaning of his jacket before the big day. Hotel room for the night before and day of the wedding: $165 (Rebecca’s parents gifted an additional $300 for this). We didn’t originally budget for a hotel room, but when we learned we would be gifted funds for this, we decided to splurge. It was TOTALLY worth it! Not only did it give us a peaceful, luxurious place to relax and get ready, but we also picked a hotel just around the corner from the wedding site to give us more time to mosey through the morning. This was the single-most unexpected stress-reliever of the day! Ceremony venue: $0 due to wedding size (under twenty people). Event permits through the New York City Department of Parks & Recreation are $25 for groups of twenty people or more for most areas in the park, making this an affordable ceremony venue! Officiant: $0, provided to us by Donnie’s brother. Photography: $0. Our photography was donated to us by Shadi as part of an outreach effort to the LGBTQ community following the election, via the Photographers for Orlando network. We would not have been able to have professional photography without this act of love! Flowers: $30 total! 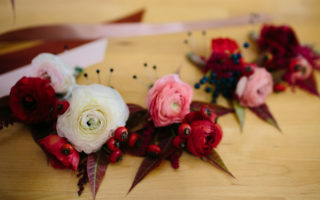 Prices for wedding flowers can be expensive, but there are so many options for premade bouquets and loose flowers all over NYC! It was only $20 for the spray roses, wax flowers, and greenery, plus $10 at a craft store for ribbon, glue, and floral tape to wrap them. I purchased the flowers in a freely arranged bunch and took them home to DIY my bridal bouquet and Donnie’s boutonnière. Pro-tip: Just buy your flowers and get out. Don’t tell them what they’re for, or prices can skyrocket in an instant! Hair and makeup supplies: $40. Hair and makeup styling: $0, DIY, with help from a friend. After-wedding dinner and drinks: $0, gifted to us by family and friends in attendance. Donnie’s wedding ring: $249 + warranty and taxes = Total $358. Rebecca’s wedding ring: $135 (purchased pre-owned for a discount) + $80 for sizing of band and cleaning of engagement ring = Total $215 with tax. Honestly? Postponing, downsizing, and limiting our time spent planning. You read that right. We postponed our original date, and you know what? It felt great! We set our original date about six months out for an October wedding, but we had just uprooted ourselves and moved cross-country so Donnie could join the cast of an Off-Broadway musical. We both had new jobs, we had just moved into our second NYC apartment in four months, and life was showing no signs of slowing down. When we started planning our initial wedding, we were getting so excited about possibilities that we started over-planning. In the grand scheme of weddings, what we were over-planning for would still have been a very modest event, but it was still too much for us with all of the life changes we were going through. We scrapped everything in June and didn’t plan to set a new date for another year or so. When the recent US election happened, though, we realized that we needed to act quickly in the face of a very anti-LGBTQ presidential administration. With both of us identifying as queer and Donnie being a transgender man, we were (and still are) worried. We were satisfied with our decision to postpone our original wedding, but we wanted to get married as soon as possible to secure our rights as a legally married couple. We decided to get married on November 26, 2016. Once we chose our new date, we only had two weeks to put this thing together, so we had to focus on our love and the few things we really wanted, rather than worrying about a bunch of details that were nice, but weren’t all that important to us. In the end, we got what we had wanted all along, and what we really wanted was an elopement with just us and whoever happened to be able to show up. Breaking the mold and doing this our way was totally worth it. It kept our plans (and budget!) focused, and it was beautiful. Embracing the context of the timing of our wedding also gave it a special, defiant kind of power that it might not have had if we had kept our original date or waited until “better times.” Life threw some unexpected things at us, so we adjusted and made the best of it. What wasn’t worth it was searching all over the place for the perfect anything. Here’s an example: Once I picked my dress, I started to search everywhere for the perfect shoes. Whyyy? I ended up choosing the very first pair I tried on after several days of looking. I was trying to avoid suede because I wasn’t sure if it would rain, but honestly, the ones I got were warm and comfortable, and a few layers of suede protector kept them looking brand new by the end of the day. Did I mention they were the very first pair I found? I could have saved myself so much time and energy! We just went with the flow in so many ways for this wedding, but for some reason, I got caught up on shoes. Trust your instincts. There are a million options out there, and there is no such thing as any one thing being more perfect than another. There are only multiple ways to make this day amazing. Also, stressing over a reception wasn’t worth it for us. We learned that the first time we tried to plan our wedding. We found a great venue with awesome open and cash bar options, with a bar and food minimum that we didn’t even have to pay in advance. However, we didn’t have the budget to cover that minimum if for some reason the cash bar didn’t reach it, so we were stressing about how to make it all happen without, well, stressing about it all night! After we postponed, scrapped all of that, and then started planning again in November, we decided to skip the reception entirely in favor of having dinner and going out to our favorite bars in the West Village. We had an Italian dinner across from the hotel, started our partying at Stonewall Inn, and then ended belting show tunes at the top of our lungs at Marie’s Crisis. It was absolutely perfect. I guess the theme here is this: The one thing that’s not worth it is stress! If something is stressing you out, either trust your instincts or try something different! At the end of the day, you’ll be married, right? You’ll have celebrated your love together, right? That’s all that really matters. Friends and family. So many friends and family. Even people we had never met offered to help make it special, which is how we were able to live stream it to friends and family across the country, how we got our beautiful pictures that so perfectly captured the important moments of the day, and how we kept our spirits high and felt validated in our decision to marry in such a short time. Family and friends shared in our excitement and never once expressed any doubts. Our parents actually called us to encourage us to get married as soon as possible, even if it meant they couldn’t be there with us. The love we felt from the people we cherish so much in our lives made this day extra beautiful and special. Be flexible. Make lists and have contingency plans if you’re Type-A and really want to feel secure about certain things, but have Plan-Bs that you love as much as your Plan-As, and don’t shy away from changing your plans as needed. We all try to orchestrate the perfect day, but perfect doesn’t always mean that one way is more right than another, even when we think it is! For us, our outdoor location was really important, but we were having bad weather all week. We chose a spot along the lake across from the Bow Bridge, which is one of our favorite locations in Central Park. We really wanted to get married by the water, but our location was also close enough to the Bethesda Terrace that we could easily move there in case of rain. We already knew we wanted pictures under the terrace because of how iconic it is, so we decided that in the case of rain, a wedding under the terrace would give us an equally beautiful experience as the Bow Bridge—it would just be beautiful in a different way! After doing some research and finding so many gorgeous ceremony photos there, we almost changed our location entirely for the sake of convenience. We decided that the universe would pick for us. If it was sunny, we would wed by the lake across from the Bow Bridge; and if it was rainy, we would wed under the Bethesda Terrace. After a week of freezing cold and rain, the universe surprisingly picked the Bow Bridge. Of course, we got plenty of pictures in both places! Our favorite thing about our wedding was the love and support—and encouragement—we got from friends, family, and even complete strangers. Our wedding was a snapshot, a tiny peek into the uncertainty that so many LGBTQ couples are now facing, and we refuse to reduce our pride. We refuse to put our love on hold. In fact, we’re going to live it even louder. There’s a special kind of power in that this belongs to all of us, and we feel so lucky that it was such a big part of our celebration. We feel so lucky that so many people in our lives supported it and were there for us. It meant everything in the world. The most surprising thing about our experience was how easy it was to break from tradition and keep it simple and focused. It was also freeing to keep an open mind when searching for details like attire or flowers. 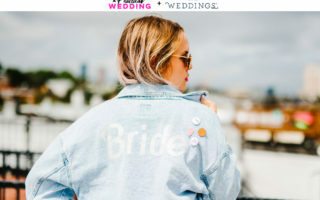 We really didn’t have time to spend finding anything specific, and we were lucky enough not to feel—ahem—married to any style of dress or suit, type of flower, color theme, or specific ceremony location. We went with the flow, and that helped us welcome new options as they came along. Our day ended up being one of the most beautiful fall days we’ve ever seen, we felt amazing, and we had so much fun celebrating our love together. We didn’t plan for perfect, but that’s exactly what it was. Perfect.